TV show dates: September 25, 2017 — January 29, 2018. Performers include: Anne Heche, Mike Vogel, Natacha Karam, Demetrius Grosse, Noah Mills, Hadi Tabbal, Tate Ellington, and Sofia Pernas. An undercover military drama from creators Dean Georgaris, Daniel Cohn, and Jeremy Miller, The Brave TV show features Defense Intelligence and Special Ops units teaming up to save innocent lives around the world. 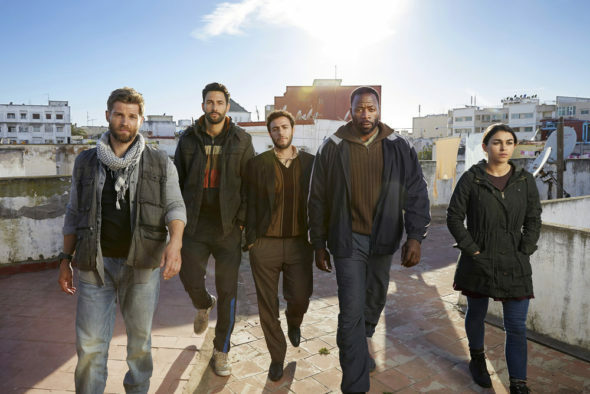 The series centers on Captain Adam Dalton (Mike Vogel), who leads a daring Special Ops squad of well-trained undercover specialists. Dalton’s team consists of Sgt Jasmine ‘Jaz’ Khan (Natacha Karam), a superior sniper; CPO Ezekiel “Preach” Carter (Demetrius Grosse); combat medic Sgt Joseph “McG” McGuire (Noah Mills); and intelligence officer Agent Amir Al-Raisani (Hadi Tabbal). Back in their Washington D.C. headquarters, D.I.A. Deputy Director Patricia Campbell (Anne Heche) oversees support and analysis for Dalton and company. Campbell’s unit of analysts includes Cultural Specialist Noah Morgenthau (Tate Ellington) and Mission Coordinator Hannah Archer (Sofia Pernas). Together, this trio provides the world’s most advanced surveillance technology. Whether in D.C. or on the ground, the members of this resilient, elite team — both in D.C. and across the world — share an unparalleled commitment to liberty. While they usually face seemingly insurmountable odds, they are dedicated to completing their missions successfully, regardless of the dangers and challenges thrown at them. What do you think? Did you enjoy The Brave TV series? NBC have cancelled or renewed this TV show for season two? I love this show.Its let the younger kids show how life is not these stupid show what’s on now.please let this show returned.